Willow was chosen as my first 'show' cat, but he is much more than that. He is my big, brown bear and my star. He is everything a male Ragdoll should be. Big, cuddly, stately, imposing but still very cheeky and naughty when he wants to be. From a very early age he was the kitten who wanted to be picked up and cuddled instead of playing with his siblings. He is the boy who spends most of the time fast asleep but as soon as a visitor comes he wakes from his slumber and slowly walks over to you then places himself on your lap or by your side and will stay there until you leave then go back to his bed. He is the boy who helps me in the garden because he has not worked out how to jump over the fence. He has accompanied on many journeys up and down the country to shows and talked to me on the long, sometimes lonely trip home. He is a bit plump, very shady but such a shining star and has made many friends over the years. 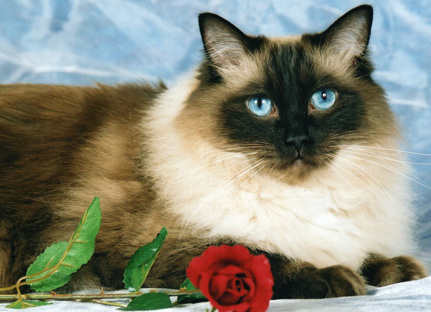 Before gaining the title of Grand Premier he also won overall best in show at the Progressive Ragdoll Breed Cat Club Show 2004. He lives out a happy retirement watching little upstarts from a great, safe, height. I want to thank Christine Hodcroft for this charming man, Lorraine Swain of Ragamews Ragdolls and Barry Smith of Leasowes Ragdolls who helped me chose my first proper show cat. I hope my Billy Willow has done you all proud. I love seal mitteds'. Dylan is Dougal's (Ch Spiritdancers Dumbledore) uncle so I knew when I was going to view Dylan that he would have that 'special' seal mitted look. Again, love at first sight. A darling boy who was not very big as a kitten but wow, he has grown into a very large gentleman. He has a lovely retrousse profile. His eye colour could be better for a seal but I love him. A bit like Dougal in that he did not like being shown so his potentially good career was halted. He likes nothing better than to play with young kittens and give them an 'uncle Dylan' wash. He sleeps on my bed at night and does not get up until I do in the morning. He also likes to retrieve his favourite fluffy ball whenever he gets the chance. I thank Heather Sabine for this handsome boy. Jimjams is from the first litter I bred. Quite a shy lad who just wants to get on with life quietly until he goes in a show hall when he becomes a complete and utter flirt. He loves it. He will be anyones friend and is a definite lady's man with his gentle, outgoing nature. His coat is very silky soft and takes very little maintenance. His eye colour could be a whole lot better and sometimes his eyes look quite big and round but that is JJ's look - the sad-eyed look. Designed to melt the hardest of hearts. I have always loved red (or ginger!) cats, especially as I am a redhead myself. He has done quite well on the show bench but has a lot of maturing to do. Another lad who enjoys sleeping on mummy's bed at night. A very special boy that I am so proud to have bred and own. Bert is my first stud boy. 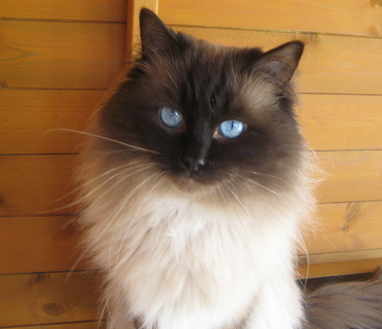 His father, Barney, has produced many beautiful Ragdolls over the years with very good temperaments with their own 'Barney' look that is familiar to a lot of people. Bert passes on his lovely personality and good looks to his babies. He is gentle and playfull and has the most amazing loud purr but he can also be quite authorotative when he wants to be. He loves his food and a comfy bed and he adores being brushed and groomed, especially on his belly. He has proved to be a very gentle boy with the ladies and does like to sweet talk them. No lady can resist his charms! Bert has produced some beautiful kittens and has made steady progress on the show bench and received lots of very good judges reports. He gained the title of Champion at the Yorkshire Cat Club Show 2010. Thankyou to his judges Mr Leppard, Mrs Perkins and Mrs Butters. On 30th July 2011 Bert and I attended our first TICA Show in Altrincham. I am very proud to say he became a TICA Champion on the day. On 29th September 2012 Bert became a GCCF Grand Champion. I would like to thank his judges Mrs Hamilton, Mrs Kilby and Mrs Gregory. I am very proud to say that on 8th November 2014 at The British Ragdoll Cat Club show Bert became an Imperial Grand Champion. I would like to thank his judges Mr Pearman, Mrs Tokens, Mrs Culf, Mrs Kilby and Mrs Butters. Bert is only available at invitation stud. I would like to thank Christine Hodcroft and Sue Allen for making it possible to own this darling boy. Bert carries blue and is also a DNA tested chocolate carrier but negative for cinnamon. Ollie certainly has a story to tell. He spent the first five months of his life as Dolly! I and five vets who examined him thought he was a little girl. Imagine my surprise at a show one day when he was pronounced a boy. Obviously a late developer. Ollie has proved to be a little character. I nearly lost him as a tiny kitten three times but he showed what a tough cookie he is to survive and thrive and what a beautiful boy he is growing in to. He made the decision long ago that he did not want to leave his mummy so made us all think he was a little girl. I do have the last laugh - the name Persephone has to stay. He has done really well on the show bench. 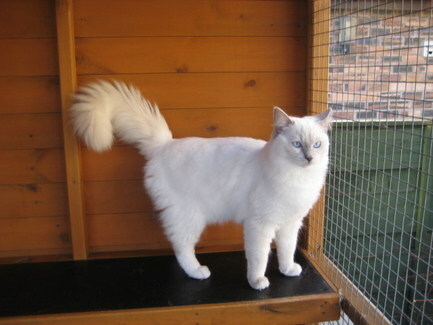 He won his first premier certificate at just over nine months of age, awarded by Sally Rainbow-Ockwell, beating some very good older competition at the Progressive Ragdoll Breed Cat Club Show and then went on to win Best of Breed against more mature, titled Ragdolls. Ollie gained the title of Premier at the Coventry and Leicester Show on 27th February 2010. Many thanks to his judges Sally Rainbow-Ockwell, Elaine Culf and Barbara Prowse. Ernie is a special little boy, not only is he a perfectly marked mitted boy but he is also lilac. This has been proven by DNA testing. Ernie is a very loving little chap who likes nothing better but to find a lap to curl up on. If you want to read the paper when he wants your lap you can think again. He likes to spend time with all the cats in the household and is a very playfull little boy. Ernie is already good friends with his daddy, Bert and his younger brother, Clouseau. So we now have a Bert and Ernie in residence. Ernie (or 'little Ern') is the one with the short, fat, hairy legs. Ernie is neutered. Clouseau is from the same mating that produced Ernie. He is a potential stud boy and DNA tested as lilac. 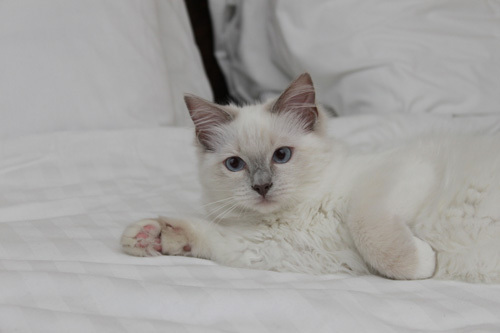 He has the same 'powder lilac' colouration as his brother, Ernie. 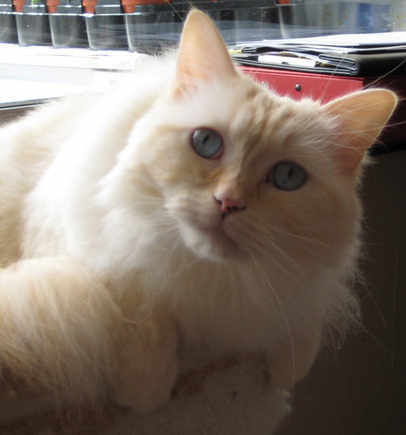 Clouseau is a very, very gentle boy who loves to be cuddled and fussed. He spends hours playing and sleeping with his big brother Ernie. With his fathers gentleness and his mothers playfull nature he has inherited all the good points of his parents natures. His coat is very dense but incredibly silky soft. 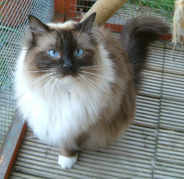 He is not well marked as a mitted Ragdoll so cannot be shown but has been on exhibition and also represented the Ragdoll breed at a seminar. In May 2012, Clouseau's first kittens were born. Clouseau is only available at invitation stud.